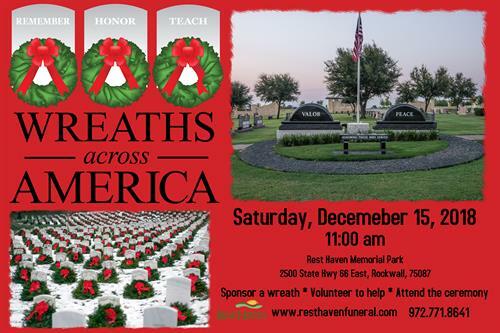 Rest Haven Memorial Park is honored to be a designated cemetery for Wreaths Across America again this year. Please save the date and visit this Events page for more details. You can register to volunteer at our event and/or donate a wreath here. You may also attend the ceremony without volunteering or donating. The deadline to donate a wreath online is December 3, 2018.